When a business becomes large and performs a large number of transactions daily, it finds the single journal book insufficient to keep a primary record of all the transaction. The task of journalizing all the transaction is troublesome and expensive. It does not provide classified information immediately. It fails to report the total amount of credit purchases and credit sales. The practical system of primary record of the transaction is subsidiary books. Instead of maintaining a single journal book, a large sized business maintains some journal books. The collective form of all these journal books is known as subsidiary books. They are a subdivision of Journal. They are the set of a primary book in which the transactions of the business are recorded at the first time in a classified way. Purchase Book: Purchase Book is the first entry of all goods purchased on credit. It is the primary record of all the credit purchases, which are either for reselling or further processing. It does not record cash purchase. Purchase Return Book: Purchase return book is the first entry of all goods returned to suppliers. It is the primary records of all the purchase returns. When the good purchased is found defective, damaged, in an excess quantity and not as per the order placed, they can be returned to the supplier. It is prepared on the basis of a debit note. Cash Book: A cash book is the primary records of all the receipts and payments made in cash and through a bank. It has the features of the subsidiary book as well as the principal book. Mainly, it is a subsidiary book as it is the first entry of all the cash and banking transaction. It is a part of the principal book or ledger as it serves the purposes of cash and bank accounts in the ledger. Sales Book: Sales book is the first entry of all the goods sold on credit. It is also known as sales journal. It is the primary record of all the credit sales. It does not record cash sales. It is prepared on the basis of the outward invoice sent out to the customer. Sales Return Book: Sales return book is the first entry of all the goods returned by customers. It is the primary records of all the sales returns. The sales return book is prepared on the basis on the basis of credit note sent to the customer. Journal Proper: Journal proper is a subsidiary book that records only non- recurring transactions in chronological order. It records those transactions for which no separate subsidiary book has been provided. Credit purchase and sale of assets, bad debts, depreciation and goods withdrawn by the proprietor are some of the examples of transactions, which are recorded in the journal proper. They avoid the need of passing journal entry for repeated type of transactions. They keep classified records of the business transactions in a systematic manner. They help in making the job of audit easier and economical. They help in minimizing errors and frauds and controlling the transactions effectively. They make the books of accounts clearer, clean and informative. They help in saving time and money for recording transactions. An invoice is received from the supplier while buying goods and it is sent to the customer while selling goods. It is a statement, which is prepared and sent out by the seller along with the goods to buyer mentioning the details of the goods. It states the items of goods, quantity, unit price, total amount, and discount allowed, expenses incurred on behalf of the buyer and net payable amount. It represents the sale transaction. It serves as the basis for maintaining records in the purchases and sales book. Purchase Book is the first entry of all goods purchased on credit. It is the primary record of all the credit purchases, which are either for reselling or further processing. It does not record cash purchase. A cash book is the primary records of all the receipts and payments made in cash and through a bank. It has the features of the subsidiary book as well as the principal book. What are the importance of subsidiary book? 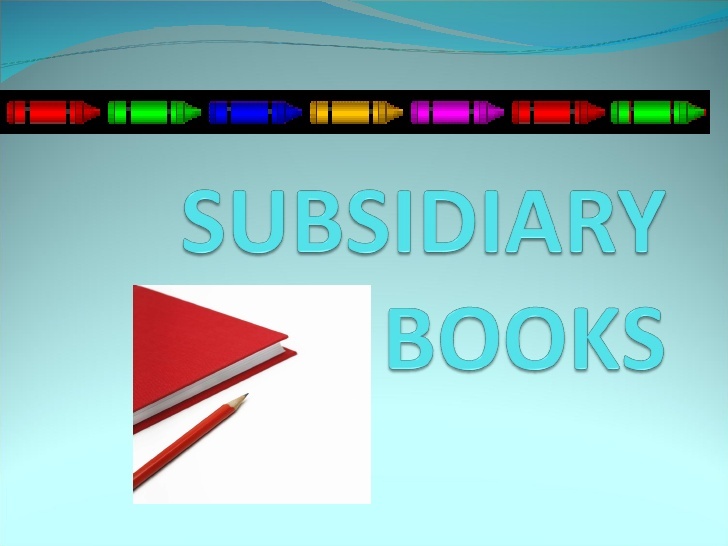 What is a subsidiary book? Instead of maintaining single journal book, a large sized business maintains some journal books. The collective form of all these journal books is known as subsidiary books. They are the subdivision of Journal. They are the set of a primary book in which the transactions of the business are recorded at the first time in a classified way. According to Dr. A. N. Agrawala, "Subsidiary books of accounts are also called books of original entry because all the transactions are recorded originally or in the first instance in this subsidiary book." According to J.R. Batliboi, "Subsidiary records are also known as book of original entry, as transactions are entered there in the first instance so that they may be subsequently transferred to their respective accounts in the ledger." From the above definition, it is clear that subsidiary books are the classes of journal in which a set of primary books are maintained to make first entry of all the transactions in a classified way and to help for immediate posting in the ledger. Purchased goods from Sujan for Rs.3,500 on cash. Goods returned to Prince Trading House for Rs.2,500 being defective. Cash sales of Rs.4,000 made. Cash of Rs.6,000 paid to Anisha. Cash of Rs.50,000 deposited in the bank. Opened bank account with cash of Rs.50,000. Paid cash of Rs.3,300 to Pujan and received discount Rs.200. Received cash of Rs.5,200 from Gunjan and allowed discount Rs.300. Cash of Rs.2,500 deposited in the bank. Commenced a book shop with cash of Rs.2,50,000. Opened a bank account with cash of Rs.2,00,000. Goods of Rs.50,000 purchased by cheque. Paid to Pramila by cheque of Rs.19,000 and received discount of Rs.1,000. Received interest of Rs.3,000 on investment. Opening bank balance of Rs.2,50,000. Cheque of Rs.40,000 received from Subin. Paid to Ubin by cheque of Rs.60,000. Goods of Rs.25,000 purchased by cheque. Cash of Rs.15,000 withdrew from bank for official use. Paid for salaries by cheque of Rs.50,000. The collective form of all these journal books is known as ______. Subsidiary books are sub-division of ______. How many types of subsidiary books are used in Nepal? Which of the following is a book of prime entry? The source documents for entries made in the Return Outwards Journal are ______. The correct way of accounting an amount received from a credit customer is ______. In emergency, the petty cashier may give staff loans of small amounts. Regularly petty cashier is reimbursed to make up his cash balance to the imprest. The petty cash book could be either a subsidiary book or a main book of accounts. Every payment made by the petty cashier should be supported by evidence. Any Questions on 'Subsidiary Books '?